N-heterocyclic carbenes, which are emerging as metal-mimicking materials to activate or to stabilize small molecules, have been explored to aim at capturing and releasing biologically important molecules such as nitric oxide and carbon monoxide. 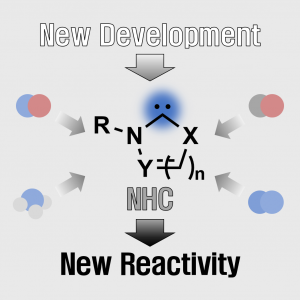 With the unique property, NHCs have been successfully demonstrated to stabilize nitric oxide radicals and to control the fixation and release of nitric oxide. Moreover, NHCs have been explored for various catalysis as either supporting ligands or organic catalysts. In order to maximize the reactivity of NHCs, electronically and sterically optimized NHCs will be synthesized for the potential applications to catalysis for challenging reactions and to emergent materials incorporated with multifunctional modular porous materials. 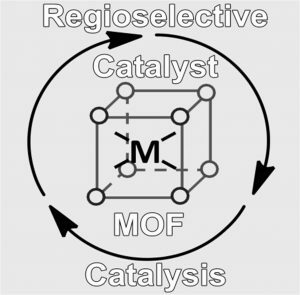 Metal‐organic frameworks (MOFs) will be investigated as tools to enforce unprecedented selectivity in reactions such as C–H bond oxidation of hydrocarbons and direct anti‐Markovnikov addition of water to alkenes. MOFs with embedded organometallic catalysts will be synthesized, and the effects of modulating both the MOF and catalyst components on the selectivity of organic reactions occurring in such materials will be explored. The constraints imposed by both the catalyst and MOF architecture on the orientation of organic molecules in bond‐forming and bond‐cleaving transition states can lead to unprecedented selectivity in the catalysis of reactions involving organic molecules. The project will solve long‐standing unsolved problems in selective catalysis such as selective C‐H oxidation of hydrocarbons and anti‐Markovnikov addition of O‐H bonds to alkenes, which will allow for more environmentally friendly production of economically important chemicals such as alcohols and amines which are mass produced worldwide. Methods for mild and selective C–F bond activation and formation are studied in our lab to enable direct conversion of 19F‐containing precursors into 18F‐labeled positron emission tomography (PET) tracers. The synthesis of transition metal complexes with appropriately designed ligands will be explored to achieve the mild and selective C C–F bond activation and formation of complex molecules. This technology will be applied to develop PET imaging tracers for more efficient diagnosis and research of Alzheimer’s disease (AD). Methods for mild and selective C–F bond activation and formation can contribute to expand PET imaging technology by allowing access to a variety of PET tracers in a short amount time. 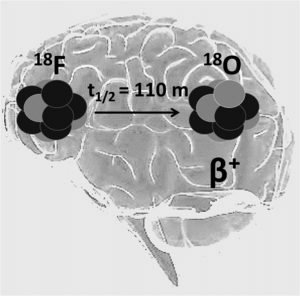 The rapid‐access technology for PET tracers will be applied to develop PET imaging tracers for more efficient diagnosis and research of Alzheimer’s disease (AD). 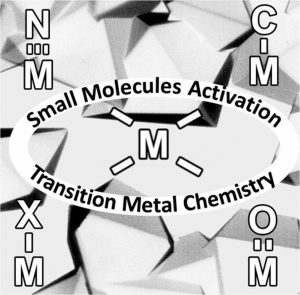 Our group is interested in the design and synthesis of well‐defined low‐valent transition metal complexes for activating small molecules. The novel and practical transformations of inert small molecules such as N2, O2, CO2 and CH4 into useful chemical feedstocks will be explored. Our ultimate goal is to develop efficient and mild methods to utilize these abundant chemical feedstocks in transformations relevant to organic synthesis, industry and alternative energy. People in our group will become an expert in inorganic and organometallic synthesis including basic organic synthetic techniques. In addition, We will also explore many spectroscopic techniques including UV‐vis, FTIR, EPR and multi‐nuclear NMR, Xray crystallography ,and quantum‐chemical calculations (DFT) to understand chemical transformations that we are developing.